Quite some time ago I was honored to be a guest on Tonight Live with Paisley Beebe, one of SL’s most popular in-world shows. On Sunday I’ll be appearing on the show again due to an unexpected invitation from host Paisley. What’s the occasion? I believe Paisley wants to quiz me about the recent SLCC held in San Francisco, California, which I (and she) attended. Not only did we both attend the convention, we hung out in Real Life several times and even managed to grab a wonderful midnight dinner together. 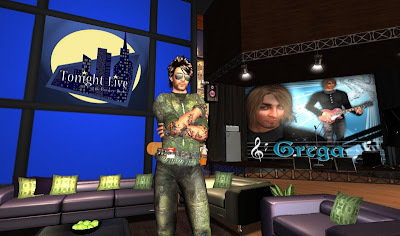 The Tonight Live show starts at 6PM SLT on this Sunday, 30 August. Yes, it will be recorded, but there’s nothing better than watching live in the audience, and you can do so by teleporting to Paisley's Northpoint Studio. I think I can actually make it to something in SL for once in my life! I'll try to be there. Me too!! I'll try to be there also! Congrats!! Nice job!! Great show! Maybe I can shake your hand at SLCC 2010? I would be very pleased to meet you Tym! See you in 2010!